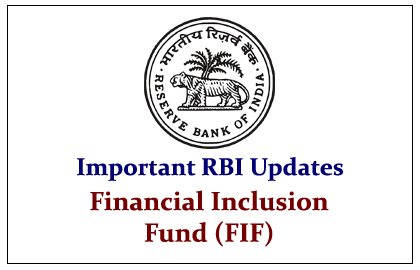 Dear Reader, Important recent RBI updates on Financial Inclusion Fund (FIF) were given here, which will be more useful for the candidates those who are preparing for upcoming bank exams. 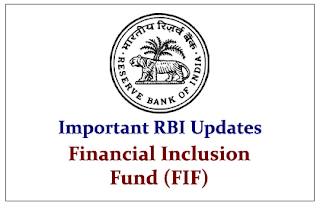 TheReserve Bank of India (RBI) has formed a singleFinancial Inclusion Fund (FIF)with a corpus of 2000 crore rupees. The fund was formed by merging the Financial Inclusion Fund (FIF) andFinancial Inclusion Technology Fund (FITF). TheRBI also finalised the new scope of activities and guidelines for utilisation of the new FIF in consultation with the Union Government. The new FIF will be administered by the reconstituted Advisory Board constituted by Union Government and will be maintained byNABARD. · The Financial Inclusion Fund (FIF) and Financial Inclusion Technology Fund (FITF) were constituted in the year 2007-08 for a period of five years with a corpus of 500 crore rupees each to be contributed byGovernment of India (GOI),RBI and NABARD in the ratio of 40:40:20. · The development and promotional activities include creation of FI infrastructure across the country, capacity building of stakeholders, creation of awareness to address demand side issue, enhanced investment in GreenInformation and Communication Technology (ICT)solution and increased technological absorption capacity of financial service providers / users. · The fund shall not be utilized for normal business / banking activities. · Support for funding the setting up and operational cost for running Financial Inclusion& Literacy Centers in sync with the objective of Union Government for setting up Financial Literacy Center up to the block level under thePradhan Mantri Jan Dhan Yojana (PMJDY). · Support to NABARD& Banks for running of Business& Skill Development Centers including R-SETIs (to the extent not provided by State Governments) to impart skill sets necessary for undertaking income generating activities and for providing forward linkages for marketing activities. · Common Services Centres (CSCs)established byService Centre Agencies (SCAs)under theNational e-Governance Plan (NeGP). · Primary Agricultural Societies (PACs).